The old junkyard still has a few leftover pieces of junk scattered around the 24 acres, including the car crusher that stands in the middle of the property. On May 8, the voters of Berlin Township will decide whether or not to overturn a rezoning measure approved by trustees Oct. 9, allowing the property to be zoned Planned Industrial. 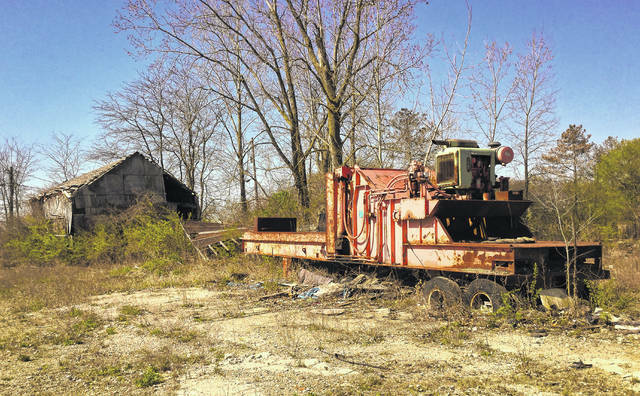 If the zoning stands, the proposed use of the property is an industrial park/concrete plant. On Tuesday, May 8, Berlin Township voters will decide whether or not to approve the debated rezoning of 24 acres of land located on U.S. 36/state Route 37 for a proposed industrial park/concrete plant. Trustees approved the rezoning request from Savko Brothers Properties X LLC Oct. 9, 2017, but many residents disagreed with the decision and petitioned for a referendum to be placed on the upcoming ballot. Voters will need a “majority yes vote” to pass the adoption of the zoning amendment or a “majority no vote” to defeat it. The property’s last use was that of a junkyard, where there are remnants of old car gas tanks, junk motorboats, the car crusher, asphalt and concrete, and several buildings now in ruins. Shade considers the property to be a brownfield site because of leaked oil and gas from vehicles or chemicals that were dumped there during a time when regulations were more relaxed. However, whether voters defeat the rezoning or not, the concrete plant will still be built, according to Shade. He said as of April 18, Marty Savko purchased the property next to the parcel in question at 5427 state Route 37 E., Delaware, where the plant will be built if the rezoning amendment is defeated. “It’s already zoned Planned Industrial,” Shade said. The property is where Buckeye Tractor currently sits. Quinn said he equates Savko’s purchase of the property as the difference between a slap in the face and a stab in the gut. Quinn has maintained that his objection isn’t with the construction of the concrete plant. He said in an earlier report that it’s the “80,000-pound trucks” and kids standing next to the roadside that bothered him. Quinn said that the traffic pattern suggested by the Ohio Department of Transportation calls for truck traffic not to cross U.S. 36/state Route 37, but to turn right and then make a U-turn at Lackey Old State Road to go to Interstate 71. Quinn’s defense is that a concrete truck tried to make a U-turn right in that intersection on Oct. 11, but the truck ended up in the ditch instead. A traffic study was not warranted, but Savko had a study done because of concerns about traffic safety. Shade said according to a traffic study done by ODOT in 2010, the traffic was estimated at 30,000 to 60,000 vehicles per day for the corridor. “The trucks coming and going from Savko’s plant will only represent .0008,” he said. Earlier this week, The Gazette talked with Berlin Township Fire Chief Craig Hall about the proposed Del-Co Water tower to be built on the Savko property. The Gazette contacted Glenn Marzluf, Del-Co Water Company’s general manager, about construction of the water tower. He said within four to 10 years Del-Co has plans to build a water tower and has talked with Savko about putting it on the property. Those that are opposed to the rezoning measure have posted in a blog that Del-Co will build the water tower anyway, and the fire department will still get the water pressure that is needed whether it is on Savko’s property or not. Quinn said that he has nothing but respect for Savko. This entry was tagged Berlin Township, concrete plant, D. Anthony Botkin, Quinn, Savko, Shade. Bookmark the permalink.